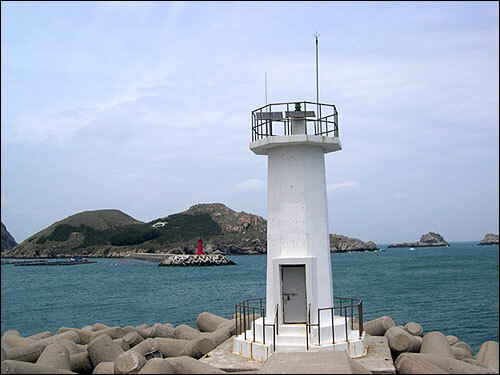 This page covers lighthouses of the Heuksan Islands, a loose scattering of islands well off the southwestern coast of South Korea. The islands comprise the Heuksan District (Heuksan-myeon) of Sinan County, a part of South Jeolla Province. Several of the islands are inhabited, but the total population (as counted in January 2014) is only 2780. Following several recent government reorganizations, navigational aids in the ROK are now regulated by the Ministry of Oceans and Fisheries (MOF). 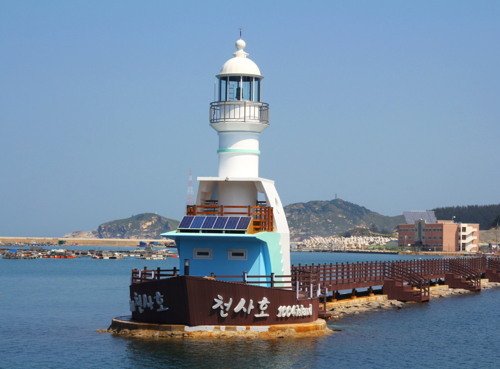 Lighthouses in Sinan are maintained by the Mokpo Regional Maritime Affairs and Port Authority. In Korean, the word for a lighthouse is deungdae (등대); dan is a cape, do is an island, and hang is a harbor. Photos and information in English for the major lighthouses of the area. Photos posted by the Mokpo MOF office. Photos posted by a Japanese lighthouse fan. 1907. Active; focal plane 84 m (276 ft); white flash every 15 s. 11 m (36 ft) round cylindrical concrete tower with lantern and gallery. Lighthouse painted white. Fog horn (one blast every 60 s). A Cultural Heritage Administration photo is at right, Google has a satellite view, and Naver also has a satellite view of the station. 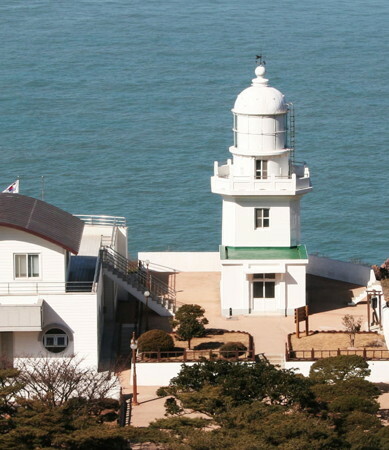 This is Korea's most remote lighthouse. Located at the northwestern point of the island of Gageodo, about 100 km (60 mi) west southwest of Jindo. Accessible only by boat. Site open, tower status unknown. Admiralty M4227; NGA 17708. Date unknown. Active; focal plane 156 m (512 ft); white flash every 10 s. 6.5 m (21 ft) octagonal white concrete tower. No photo available but Google has a distant satellite view. Located on heights at the southeastern end of Gageodo. Accessible only by boat. Site status unknown. Admiralty M4227.4; NGA 17710. Date unknown. Active; focal plane 15 m (49 ft); red flash every 5 s. 12 m (39 ft) tapered triangular white concrete tower. Hyun Kim has a view from a passing ferry and Google has a satellite view. Located on a recent extension of the breakwater of Gageodo village, at the south end of the island. Site status unknown. Admiralty M4227.1. Date unknown. Active; focal plane 195 m (640 ft); white flash every 5 s. 5.5 m (18 ft) round white concrete tower. A closeup photo (halfway down the page) and a second photo (also halfway down the page) are available, and Google has an indistinct satellite view. Located on an isolated high island about 50 km (30 mi) northeast of Gageodo. Accessible only by boat and a difficult hike up the mountain. Site open, tower closed. Admiralty M4228; NGA 17704. Date unknown. Active; focal plane 32 m (105 ft); white flash every 6 s. 6 m (20 ft) round white concrete tower. No photo available but Google has a satellite view. Located on an island about 60 km (38 mi) north northeast of Gageodo. Accessible only by boat. Site status unknown. Admiralty M4226; NGA 17700. 1931. Active; focal plane 89 m (292 ft); three white flashes every 20 s. 14 m (46 ft) two-stage square concrete tower with lantern and gallery. Lighthouse painted white. 1-story concrete keeper's house and other light station buildings. A photo is at at the top of this page, a fine closeup and a second photo are available, and Google has a distant satellite view of the station. Hongdo is a small island about 115 km (72 mi) west of Mokpo. Ferry transportation to the island is available. Located at the northern tip of the island. Site open, tower closed. Site manager: Dadohaehaesang National Park. ARLHS SKR-041; Admiralty M4222; NGA 17696. Date unknown. Active; focal plane 30 m (98 ft); two white flashes every 6 s. 8 m (26 ft) round cylindrical white concrete tower. The Port of Mokpo's photo is at right, another photo (fourth from last photo on the page) is available, and Google has a distant satellite view. Located on one of the outermost of a large collection of picturesque rocky pinnacles obstructing the approach to Chuk harbor, the harbor of Hongdo. Accessible only by boat. Site status unknown. Admiralty M4222.2; NGA 17697. Date unknown. Active; focal plane 78 m (256 ft); white flash every 10 s. 8.5 m (28 ft) square white concrete tower. No photo available, but Naver has an indistinct satellite view and Google has a distant satellite view. Light lists previously described a round tower, and a 2009 aerial view shows a round post. Located on a small island off the north coast of Daeheuksando. Accessible only by boat. Site status unknown. Admiralty M4222.5; NGA 17678. Date unknown. Active; focal plane 100 m (328 ft); white flash every 5 s. 6 m (20 ft) hexagonal white concrete tower. Naver has a photo (ninth photo on the page) and Google has a satellite view. 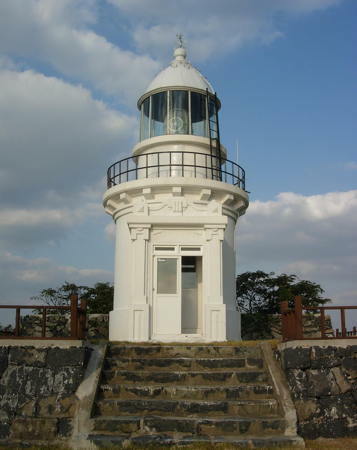 This light marks the northern tip of the Heuksan islands. The original light was on a round tower. Located on an island about 8 km (5 mi) north of Daeheuksando. Accessible only by boat. Site status unknown. Admiralty M4225; NGA 17676. Date unknown. Active; focal plane 17 m (56 ft); two white flashes every 5 s. 21 m (69 ft) round concrete tower rising from a square platform supported by piles. Tower painted black with one red horizontal band. No photo available but Google has a satellite view. Located on a shoal off the south coast of Damuldo, an island about 5 km (3 mi) north of Daeheuksando harbor. Accessible only by boat. Site status unknown. Admiralty M4225.3. Date unknown. Active; focal plane about 18 m (59 ft); white light, characteristic unknown. Approx. 10 m (33 ft) round cylindrical white tower. Hee Chan Oh has a view from the sea, several additional photos (near the bottom of the page) are available, and Google has a satellite view. Located on a small island just off the entrance to Daeheuksando harbor. Accessible only by boat. Site status unknown. Admiralty M4223.41. Date unknown. Active; focal plane 13 m (43 ft); two red flashes every 6 s. 8.5 m (28 ft) round cylindrical concrete tower, painted red. No photo available but Google has a satellite view. The Admiralty and NGA list a skeletal tower at this location. Daeheuksando is an island about 16 km (10 mi) long and about 130 km (80 mi) east of Mokpo; it is the largest and most populous of the Heuksan islands. Located at the end of the north breakwater of Daeheuksando harbor, at the north end of the island. Accessible by walking the pier. Site open, tower closed. Admiralty M4223.4; NGA 17683. Date unknown. Active; focal plane 13 m (43 ft); two green flashes every 6 s. 8 m (26 ft) octagonal concrete tower. Entire lighthouse is white. A photo is available, and Google has an indistinct satellite view. Located at the end of the south breakwater of Daeheuksando harbor. Accessible by walking the pier. Site open, tower closed. Admiralty M4223.3; NGA 17682. 2015 (?) (station establishment date unknown). 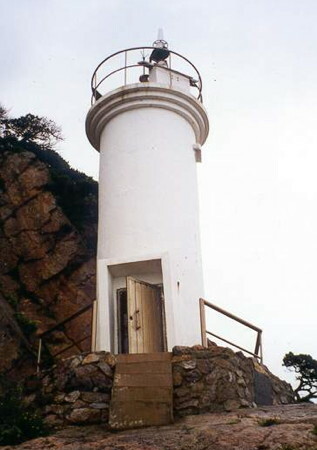 Active; focal plane about 15 m (49 ft); green flash every 4 s. 14 m (46 ft) round cylindrical concrete tower with lantern and gallery. Entire lighthouse is white. An observation platform surrounds the base of the lighthouse. A photo is at right, Jeasung Park has a distant street view of the original lighthouse, and Google has an indistinct satellite view. Located at the end of the south breakwater of Daeheuksando harbor. Accessible by walking the pier. Site and observation deck open, tower closed. Admiralty M4223; NGA 17684. Date unknown. Active; focal plane 63 m (207 ft); white flash every 6 s. 6 m (20 ft) round white concrete tower. No photo available; Naver has a satellite view and Google also has a satellite view. Located on a small island about 2.5 km (1.5 mi) northeast of Daeheuksando harbor. Accessible only by boat. Site status unknown. Admiralty M4224; NGA 17680. Date unknown. Active; focal plane 51 m (167 ft); white flash every 4 s. 11 m (36 ft) round white concrete tower. No photo available; Naver has a satellite view and Google has a distant satellite view. Located atop a steep-sided island just off the northeast corner of Yeongsando, an island southeast of Daeheuksando. Accessible only by boat. Site status unknown. Admiralty M4223.5; NGA 17688. Date unknown. Active; focal plane 46 m (151 ft); white flash every 6 s. Listed as a 6 m (20 ft) hexagonal white metal tower. No photo available, but Naver's satellite view suggests that the tower is mounted on a square concrete base. Google has an indistinct satellite view. Located on a sharp promontory on the southwestern coast of Daeheuksando. Site status unknown. Admiralty M4223.8; NGA 17694. Date unknown. Active; focal plane 128 m (420 ft); white flash every 10 s. 6 m (20 ft) round white fiberglass tower. No photo available, but Bing has an indistinct satellite view. Located on an isolated high island about 20 km (13 mi) southeast of Daeheuksando. Accessible only by boat. Site status unknown. Admiralty M4225.5; NGA 17692. Posted January 9, 2008. Checked and revised January 12, 2019. Lighthouses: 18. Site copyright 2019 Russ Rowlett and the University of North Carolina at Chapel Hill.